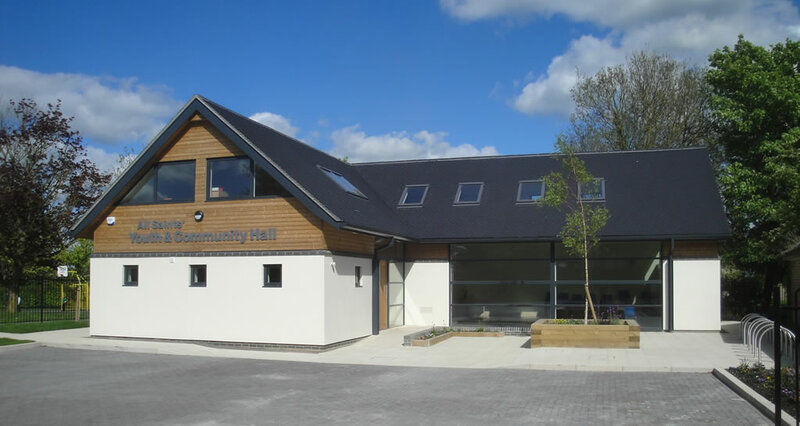 All Saints' Youth & Community Hall opened in 2012, providing a modern facility for All Saints’ Church and our local community. Our beautiful building came about after much fundraising and the dedication of many, and replaced the original pre-fab building built in the 1960s. We have strived to incorporate environmentally friendly technology, including a ground-source heat pump to feed the underfloor heating and rainwater harvesting to provide water for the toilets. By installing large windows and rooflights we have a lovely, light and airy space for all to enjoy. Bookings are welcome for one-off events or on a regular basis (subject to availability). We attract a wide range of regular users including uniformed organisations, fitness classes, first aid training, counseling, fellowship groups, business meetings and many more. We are also popular for wedding receptions, baby showers and christening parties. All rooms are accessed via the entrance hall, so can be booked and used separately. Please be aware that the kitchen is not fully accessible as the appliances, sinks and work surface are not height adjustable.